Prices of the WTI kept pushing higher yesterday and early this morning during the Asian session, prices are trading above the $60 per barrel mark after the EIA reported a larger-than-expected US oil stockpiles on the week ended on March 15. US crude oil supplies went down by nearly 9.6M barrels during last week. Furthermore, the current OPEC+ agreement to Cut oil output and ongoing US sanctions against Iran and Venezuela Crude oil exports, plus a weaker Dollar is providing the right momentum to drive the prices up. WTI prices are still surging to extend its impressive run by breaking above the $60 mark. The price is currently holding above the key support level and looks set to print new highs before entering the overbought zone. 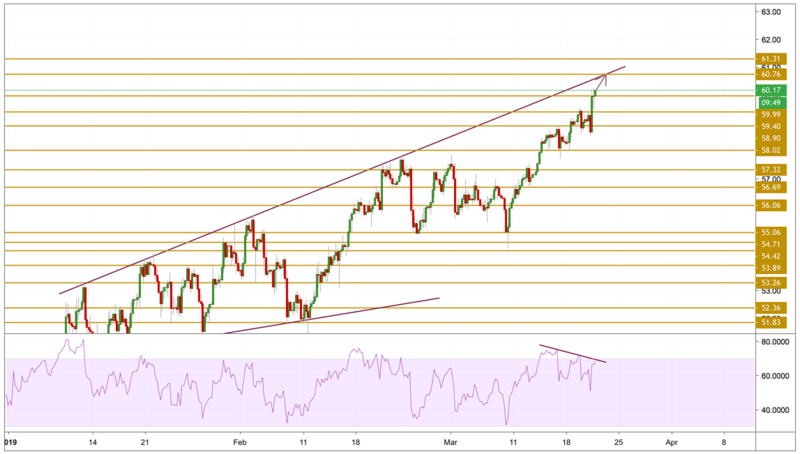 However, a divergence between the price and the momentum is becoming clearer pointing towards a potential correction but in the meantime we will be focusing on the $60.76 resistance level.